The ingredients listed in the Tofurky, though completely vegan, led me to believe that I would not like the taste of it very much. Now, the Whole Foods didn’t carry the Quorn turk’y, oddly enough they carried other Quorn products though. I continued looking until I actually found it at a more mainstream grocery store, on sale too…Frugal Bonus! The ingredients, though not vegan in any way, were at least a bit more tasty-sounding than the Tofurky. So, purely for research purposes, I decided to give it a try. I like very much that it only takes about 55 minutes to cook. The only thing that I found disconcerting, given the fact that most vegetarians are trying to detox and not re-tox, was that you cook it in a plastic sleeve. I mean tightly wrapped in plastic while sitting in a 425° oven. You can’t tell me with a straight face that there isn’t some leeching occurring into the food. I just can’t truly believe that. The directions say to poke some holes through the plastic sleeve before cooking, which I did. Only one word to the wise, don’t poke them on the sides or the bottom. This causes juices to leak out of the package and smolder in a smoky fashion on the bottom of your cookie sheet. As for flavor and texture, I did not expect to be all that wowed by either of them. I cut the slices rather thick and paired them with mushroom gravy. The flavor was surprisingly turkey-like. The texture was relatively palatable, though something about it reminded me of lunch meats or high school cafeteria food. 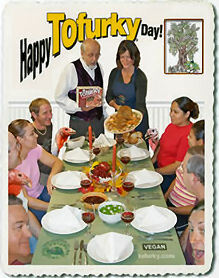 Overall it left me only slightly envious of the meat-eaters with their steamy, glistening hunks of turkey breast. The Quorn Turk’y Roast: I would recommend this product, on a 5 star scale, at about 3.5 or maybe even 3.75….worth trying and, with some creative modification, should please most dinner guests.